Krimmler Waterfall, or Krimml as the Austrians call it, is considered one of the five highest waterfalls in the world. In Europe, Krimler been voted as the overall winner with its height, but for the huge number of visitors who visit the natural attraction, more important still, is majestic beauty, revealed before us, as we which stand in the face of Krimler. 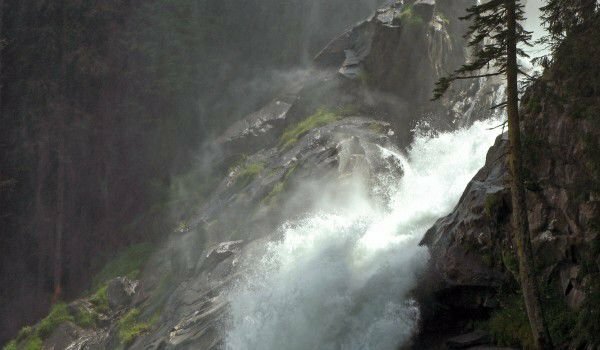 Krimml Waterfalls are located in the Hohe Tauern National Park in Austria. The Beautiful waterfalls are formed close to the town Krimmler, near to the German border province Salzburgerland. With 350, 000 visitors each year, they are one of the most visited tourist attractions in Austria. Along the waterfall is a trail, for which € 2 has to be paid, while for children between 6-15, pay € 0.50. Especially beautiful panoramic views of Krimmler can be found in "Gerlos Hohalpen". The new road has a panoramic platform and car park from where you can monitor the waterfall. The Hiking Trail, built by the Austrian Alpine Association (OeAV) allows close access to breathtaking views of Krimmler waterfall. It can be easily reached from the village Krimmler, located about 4 km from the waterfall. Thereof the main attraction of the park can be reached by a narrow winding path. It is best to visit the waterfall in spring – it is open to tourists during the period May 1 to October 31. Near it is the Museum "The Wonderful World of Water", where there is an aqua park. Krimmler’s waters descend with a deafening roar from a height of 400 meters, and the waterfall is divided into three levels - top (140 m), middle (100 m) and bottom (140 m). They are formed along the eponymous river Krimmler, which connects to Salcih, flows into Ine, then continues its his way to the Danube, which finally flows into the Black Sea. Here the water is lowered to 20 000 m3 / h, and the Krimmler waterfalls are deepest in August. The summit can be reached on a paved trail, and the whole climb takes about 4-5 hours. To facilitate access to the upper Krimmler, over a century ago the Austrian Alpine Club improved the quality of the road that leads to it. The view from the top of the waterfall is impressive and worth the effort of climbing. The middle and lower part of Krimmler are more relaxed than the top, they are enveloped by greenery.